As pollution level in Delhi reached the alarming level, someone decided to ‘rename' streets of the National Capital, resonating the deplorable air quality. A creative of ‘new' five names of Delhi street signs are going viral and netizens including Congress leader Shashi Tharoor can't stop sharing it. 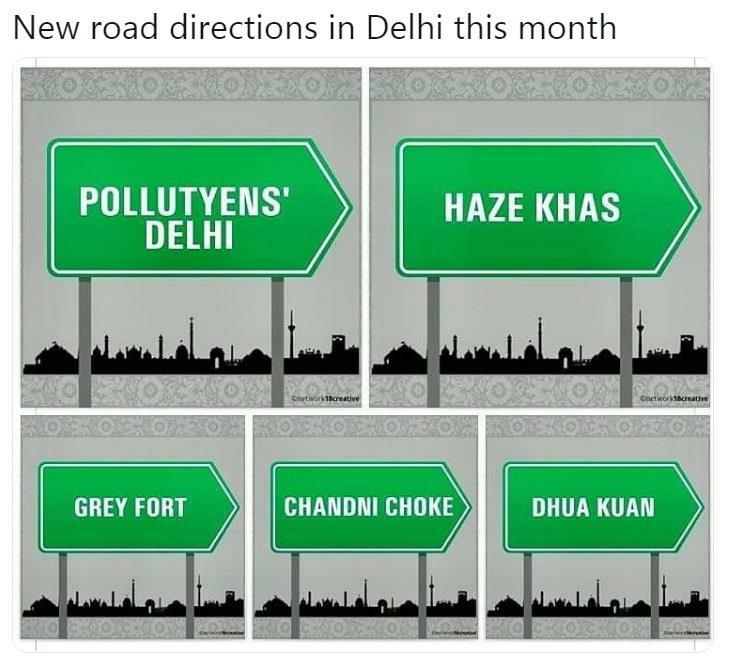 The creator gave a smokey twist to the popular street names making Hauz Khas to Haze Khas, Lutyen's Delhi to Pollutyen's Delhi, Red Fort to Grey Fort, Chandni Chowk to Chandni Choke and Dhaula Kuan to Dhua Kuan. Although the green road-signs creative first appeared on Facebook earlier this month, it got everyone talking online recently after it was shared by the Kerala MP. Can we expect atleast a discussion on the Delhi smog issue this winter session in parl? Bit of sarcasm is okay, but do you have any solution / suggestions to offer ? As the photo went viral, Delhiites are sad and alarmed that their city has turned into a ‘gas chamber'.